Wide angle compound telescope ? You could make a Clyde Bone design, which is a Nasmyth Mersenne bent ahead of the primary and out the elevation axis, viewed after reflection from a second flat with an apo refractor. If you made a 4X Mersenne, the axial output beam would be around 76mm in diameter, and a 5" refractor would give a usably wide FOV. Slide or rotate a fold flat into the path that's aligned to the Mersenne, and you're back to just the refractor view (albeit with image inversion). The 4X Mersenne acts like a 4X Barlow lens to the refractor. I think I saw this once; a TV 4" combined with a 16-20" primary mirror, and a paraxial 4-5" convex paraboloidal mirror. It was described as being a 16-20" genesis!!! Come on, Mikey- show us P-A-L-E-A-S-E-!!! Two years ago I built a periscope that attaches to my 20" Newtonian. At the top is a 300 mm telephoto that acts as an ultra-low-power eyepiece making the light rays parallel. At the bottom is an ordinary 80 mm refractor. This system lowers the eyepiece height 27" without introducing any noticeable aberrations. I could increase the length to about 55", beyond that there would be a restricted field of view. Here's a design with "wavefront"'s 12.5" primary, ground to a focal length of 72" and parabolized, and a convex paraboloidal secondary of 18" focal length (four times shorter, giving the 4X magnification). The mirrors are separated by 54", which superimposes the real focal point of the primary with the virtual focal point of the secondary. This creates collimated (parallel) light from the secondary that is 4X smaller in diameter than the primary. I put a 5" aperture refractor with 1 meter focal length viewing into the 4X Mersenne, after two fold flats. 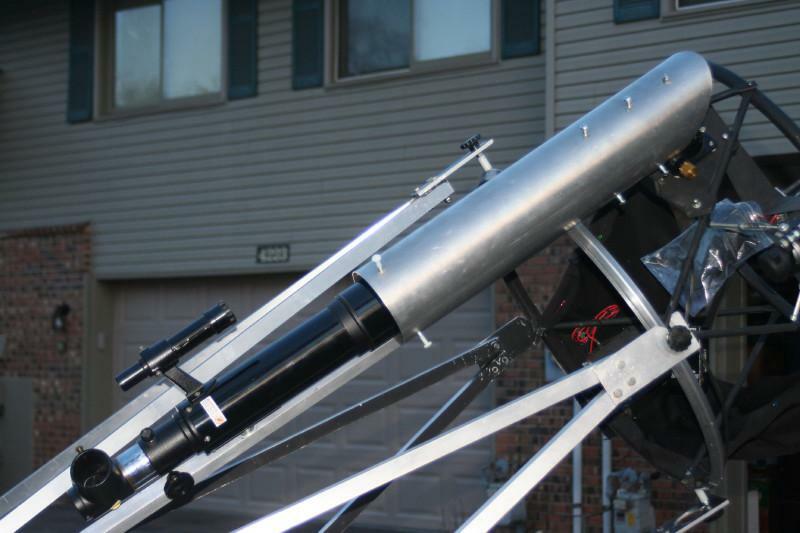 If you pull the second flat out of the path, the refractor is able to view the sky directly. Pushing the second flat back in front of the refractor multiplies the refractor focal length by 4, and reduces the FOV to 1/4 that of the refractor by itself (for the same eyepiece). The Mersenne thus acts as a 4X Barlow. Over this small FOV, the aberrations are almost non-existent. Just a thought for your consideration - seems like this is one possible answer to your OP. Mike, I thought a lot along similar lines. I'm trying very hard to like this design, but there are two issues that are not clear to me yet. What should be the relation between the diameter of the secondary parabola on the Mersenne amplifier, and the aperture on the refractor? The naive answer is - make them equal. But then the secondary parabola would act as a diaphragm for the refractor, clipping the incoming cone of light when observing at a wide TFoV. If the refractor's aperture is bigger, part of it is wasted. If it's smaller, then some incoming light from the Mersenne amplifier is wasted, effectively wasting some of the primary aperture. There doesn't seem to be a simple answer. I am not sure how to define aberrations for an afocal system, but I wonder if the Mersenne amplifier has some aberrations of its own. If the secondary parabola is negative (convex), would that compensate the aberrations (coma-like) introduced by the primary? How do you define and analyze aberrations in an afocal system? At the small fields used here, the aberrations of the Mersenne are essentially zero. Field curvature is the only aberration of consequence, which amounts to deviating slightly from true parallel light at the edge of the field. For this particular Mersenne, there are no appreciable aberrations introduced. Of course, this assumes both mirrors are perfect, as is their alignment. One thing that always bothered me about the Mersenne design (at least with a convex secondary) is that the virtual pupil image that is made by the secondary mirror is far from the refractor's objective lens. Ideally, one would want a real pupil image on the refractor's objective lens. Does having the pupil far from the refractor's objective lens make any significant difference in image quality? You could made a Gregorian secondary, yielding a real pupil image, and put the refractor lens there. However, there are practical issues with the layout which makes that option difficult. Thus the refractor is still well within the near field of the exit pupil, and almost no edge diffraction will be visible. So, at these pupil diameters and wavelengths there's no real effect of having a remote Mersenne pupil other than vignetting by the refractor. A Fresnel number of 1400 isn't even an issue for adaptive optics. If this was a 5 or 10mm diameter pupil system, or it was being used at 10.6µm, relaying the pupil image would be necessary. A Mersenne design is driven by the desired afocal magnification, which is driven by the interfacing optics. A 4X Mersenne emits an exit beam 4X smaller than the primary beam, and magnifies angles by 4X. Notice that in the drawing, the Mersenne is being fed a 0.4º total FOV, but at the refractor it's amplified to 1.6º. The higher the Mersenne magnification, the smaller the output beam, but the more field angles are magnified. The pivot point of these field angles is where the Mersenne exit pupil is located, which is always behind the secondary. A refractor that images the afocal light has to have a larger aperture than the on-axis beam if one expects to have any appreciable FOV. The extra refractor aperture is not wasted; it is used to intercept and focus off-axis light from the Mersenne. The trade in Mersenne design is magnification versus reimaging optics aperture. I used 4X in the drawing because it's a good trade value. The focal length of the primary mirror is unimportant, only the amplification ratio. But, field curvature increases with decreasing primary focal ratio, as does difficulty in alignment. That's why I chose roughly f/6 for "wavefront"'s mirror - that's a relatively easy paraboloid to make, lots easier than say an f/4 or f/3.5. The extra refractor aperture is not wasted; it is used to intercept and focus off-axis light from the Mersenne. The trade in Mersenne design is magnification versus reimaging optics aperture. Okay, got it. You just design it with a refractor aperture large enough to get the off-axis light. Now that might be a problem with a very large primary - you'd have to either use a pretty large refractor, or ratchet up the amplification factor in the Mersenne system. Now, the primary and the secondary parabolas - shouldn't they have the exact same focal ratio? Or is it the same principle - you need to design the secondary a bit larger to capture the off-axis stuff? If they have the same focal ratio, a 4x Mersenne would have a 25% central obstruction. In your diagram, it's a bit larger than that. Exactly. The primary and secondary paraboloids share a common focal point, but the secondary diameter has to be a little larger than (primary diam / M) to intercept and reflect off-axis light. It's exactly the same as sizing a Newtonian diagonal or an imaging Cassegrain. Mike, can you "cheat" and make the parallel light off the secondary a slight bit converging to lessen the diameter of the refracting part of the scope, or does that increase abberations noticeably? So aberrations are small at small TFoV, but speaking theoretically: is there a difference between a Mersenne with two concave parabolas (I know it's less practical), and one with a concave/convex pair? Would the concave/convex pair compensate aberrations partially? I guess I'm asking because I've no idea how to even define aberrations for an afocal system. Couple it with a known entity (like the objective of an apo) and see how the aberrations of the apo's objective change? Very illuminating thread, thanks Mike! You'll need to put a stop larger than the 4.5 inch flat at the secondary or else you'll be looking at a double image. Is there a totally refractive equivalent of the Mersenne? Like the Schupmann Medial but a positive objective and negative corrector of the same glass to be afocal and straight through, rather than the Mangin corrector and the tilts? I guess you can produce a field compressor this way (to be followed by a small apo) but would have lateral color problems because cannot use a field lens to bring off axis rays to the axis of the corrector. At the small fields used here, the aberrations of the Mersenne are essentially zero. One of the criteria mentioned by the OP was the he does "not like the narrow field types" and from what I am seeing here, it seems like this design results in a relatively narrow field of view, at least by my standards. 12.5 inch with a 1.6+ degree TFoV. Just kind a wondering, interesting stuff. For given aperture, the field is determined by the f-ratio of the refracting objective. An f/5 may approach 1.6 degree field diameter with 12.5 inch aperture, but the field will be not only heavily vignetted, but also likely far from perfect. The reason is that (1) secondary magnification effectively multiplies the incident angle at the lens (for typical arrangements, by about a factor of 3), and (2) wide stop separation will further aggravate off-axis aberrations in most objectives. Needless to say, such a fast lens has to be an apo triplet or Petzval for good chromatic correction, and even triplet will likely exhibit significant off axis aberrations. Here's an example of a 300mm Mersenne with a 75mm f/5.5 ZKN7/FPL53/ZKN7 triplet with still very good correction alone. Off axis aberrations of the Mersenne go off the chart already at 1/4 degree off axis. Not recommended to make a Mersenne/lens configuration without checking specific design with raytrace first.